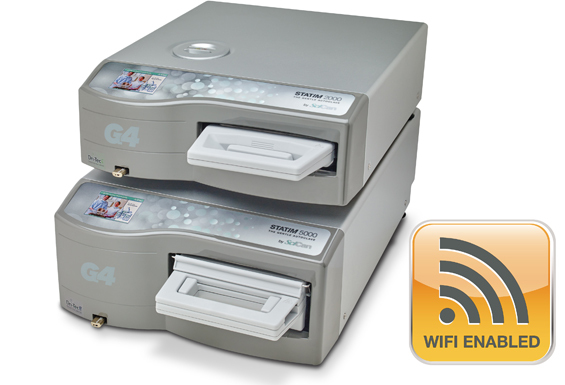 SciCan’s Statim S-cycle cassette autoclave, available in Cyprus by Attikouris Medical. Attikouris Medical Division is pleased to introduce the Statim S-cycle Cassette Autoclave that sterilises handpieces in only 8 minutes. This is a new innovation in Cyprus that benefits clinics, doctors and patients. The Statim S-cycle cassette autoclave is a compact autoclave small enough to fit neatly into a convenient space on, or under, the dental cabinetry countertop as it generates no heat and very little noise. It is an attractive, well-designed, aesthetic unit which sits comfortably with today’s surgery décor. The Statim S-cycle cassette autoclave is the fastest benchtop steriliser available. Statim will enable you to sterilise your handpieces in only 8 minutes and between patients. This will optimise your clinical time management and improve efficiency. It will also dramatically reduce the number of handpieces you will require in the average day from around seven to three; saving you money. Statim prolongs the life of expensive and delicate instruments such as fibre-optic dental handpieces, orthodontic pliers, endodontic instruments, syringe tips and diamond and carbide burs. Statim’s steam injector system provides temperature consistency and expels the air that causes oxidation in conventional autoclaves. Statim cassette autoclaves use only clean distilled water with every cycle, preventing the formation of rust and the build-up of bio contaminants. Also, a built-in air pump flushes the chamber with filtered dry air, further reducing humidity. The gentle sterilisation of the Statim and the reduced time for which your valuable handpieces are exposed to the sterilising process, will also prolong their useful life and reduce maintenance costs. The removal of air has long been recognised as critical to achieving sterilisation because air can act as a barrier to the sterilising steam. In fact, unless the autoclave can evacuate air from inside the handpiece before sterilisation begins; the handpiece would not necessarily be sterilised. This ‘pre-evacuation’ and sterilisation can only be assured in a validated S or B-cycle autoclave. The gentle action of the Statim S-cycle displaces air from the sterilisation chamber by a patented steam-injection, positive pressure pulse displacement process. This Statim process is at least five times faster than the typical 45-70 minute cycle of conventional B-cycle vacuum autoclaves. When the ‘start button’ is pressed, the steam generator heats to the optimum temperature and a defined volume of distilled water is pumped in and converted to steam. Then, a wall of steam is automatically injected into the cassette pressure chamber which is loaded with contaminated instruments. Air is purged as the steam courses through the cassette and is continuously expelled into a waste bottle. After any cycle is completed the drying cycle switches on, rapidly drying and cooling the instruments. Competitively priced, the Statim S-cycle autoclave in available in Cyprus only from Attikouris Medical Division. In addition to providing full service of autoclaves and sterilisers, we also have replacement units available at our offices in Limassol.